Scholar Base Learning Programmes use a holistic approach to education, giving students the opportunity to truly enjoy their learning. The programmes develop the child’s self confidence and a love for reading and writing. This approach to teaching helps foster curiosity in students, which in turn drives them in their learning experience. We prioritize reading, writing and public speaking skills. Students as young as four begin with a reading programme that is followed by writing. Within the different levels (basic, intensive and extensive), students will be developing public speaking skills. They get to perform in a presentation of their own choice in public, on stage. So they can choose poetry recitation, singing, story telling, acting in drama, elocution etc. There are 6 components in the Scholar Base’ scholastic approach to learning. 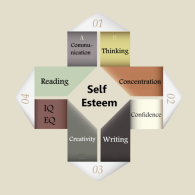 These include fostering the child’s thinking, understanding, communications, concentration, and IQ/EQ to help them develop a positive self image and confidence. Teachers generally acknowledge the importance of creativity in learning. However, this is often brushed aside as school grading policies place more importance on extensive content knowledge through memorisation. At Scholar Base, students are encouraged to ask questions, to be curious as this leads to creative thinking. Scholar Base students are given activities and projects based that encourages creativity and thinking outside of the box. We emphasizes not only the ability to think analytically, to follow through a process of creating logical arguments, finding possible answers to questions, and choosing options. We also focus heavily on exploration of new ideas, generating possibilities, and looking for different ways solving an issue. Current conventional teaching methods of transferring knowledge from teacher to students is not as beneficial to the student’s growth. This assumes that all students learn by taking in and absorbing stale information. Experiential learning. on the other hand is “learning and development that are achieved through personally determined experience and involvement”. Each student learns differently and we adapt to the student’s personal preference for learning as well as play to their strengths when we allow them to experience the learning process. Every learning experience builds increased and positive self-esteem and a stronger sense of purpose for the student. Scholar Base believes that asking questions, contributing ideas, having open discussions and seeing things from different angles is key in social and intellectual communication. Teachers at Scholar Base help students think aloud, formulate ideas, dissect the thinking process and communicate that clearly across. And as they do this the students is able to process and internalize the topic being learned, leading to a deeper understanding. It is important that students learn to articulate their own opinions respectfully and clearly by their own logical reasoning and thinking processes. Discussions are great for enhancing student participation, motivating agility in intellectual faculties, democratizing conversation, defending positions, and evaluating evidence. Schools are not just about fun and games. In fact, schools provide the perfect opportunity for children to develop formative skills by learning to focus and be self-disciplined. To accomplish great things in life, students need to learn how to work under pressure, meet deadlines, and put aside their desire to have fun to do something they may not particularly like in order to achieve a certain goal. We encourage children to develop discipline and to stay focused on a task without being easily distracted and abandoning their on-going activities. This gives them a sense of accomplishment and success when they achieve a milestone. The enhancement and growth of the students’ IQ is a typical goal for most schools across the world. Students are taught to learn, understand and apply information logical reasoning, word comprehension, mathematical skills, abstract and spatial thinking which can all be attributed to having a high IQ. But this alone is insufficient. Students also need to know how to relate to the environment and have social skills. Students with high EQs are able to identify, evaluate, control and express their own emotions, be able to perceive and assess others’ emotions and are able to understand emotional meanings. The absence of EQ development is painfully obvious as graduates are not comfortable relating to people, talking in public, making new contacts, initiating conversation etc. Students need both IQ and EQ in order to function successfully in the “real world” outside the walls of their school. As the children develop in the areas discussed above, they will also grow with a positive self image. This plays an important role in their educational goals and the pursuit of their dreams. When students gain positive self-esteem, they are able to develop into aspiring youth that are ready to take on challenges and conquer fears that lie ahead. Nothing can be too difficult for a confident person who is well-read, creative in looking for solution, socially comfortable, able to articulate persuasive communication and influence others. Scholar Base has been helping children achieve these the past 10 years. And we will continue to help more children with more chapters. To find out more about our philosophy, come pay us a visit at any of our chapters (Ulu Kelang, Old Klang Road and Sri Bintang), give us a call or just write to us. And if you are also interested in starting a chapter with us, we’d love to hear from you too. You can download a copy of the infograph here. Feel free to share so long as you do not modify it. Thanks!